Amfax is a world class test system solutions provider, delivering high quality, high performance and cost effective automated test equipment to the aerospace, defence, transport and consumer electronics marketplaces. We have built our reputation by providing our customers with exceptional service and system support, consistently solving their technically complex challenges. a3Di is the culmination of over 30 years’ experience in delivering successful manufacturing test and inspection solutions. We are proud of our commitment to quality, accountability and continuous improvement. Our numerous, industry recognised accreditations uphold this philosophy and place us in a unique position as a test and measurement integrator of holding BSI/EN ISO 2001:2015, AS9100 and CSIA certifications! 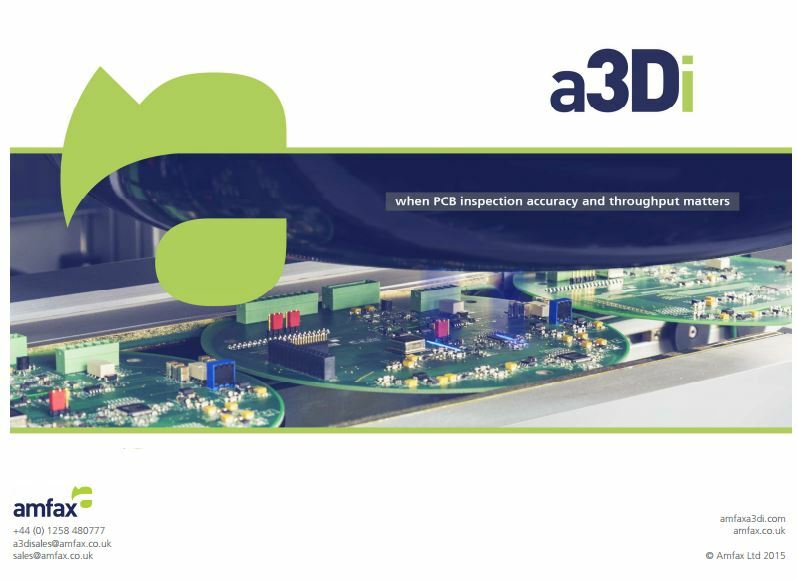 Two international patents cover a3Di's new and innovative approach to populated PCB inspection. This technology revolutionises a market historically dominated by camera-based inspection systems. Designed to meet the needs of electronics manufacturers, a3Di’s capability spans ultra-high volume requirements, complex mid & low volume, R&D designs and pre-production runs. Amfax is proud to be the lead member of the Quaver 3D solder joint study. Quaver is an InnovateUK backed research project with a consortium of members including the Manufacturing Technology Centre Coventry (MTC) and CDS (Rolls Royce). Quaver’s aim is to create a qualified 3D database of a wide range of SMT solder joints and certify the existing a3Di algorithms to inspect solder joints to the IPC610 standard. The Quaver project is underway and will be complete in 2016.